Lend a hand by becoming an Arc volunteer - The Arc of Somerset County counts on its many dedicated volunteers, and would love for you to join us today! 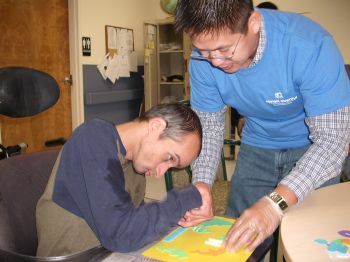 Organize a group to do a project at one of The Arc's group homes or work centers - We have had groups as small as a few people to groups of 100+! Join an event committee to help raise awareness and needed funds for Arc programs - The Arc of Somerset County has three major fundraising events each year and relies on its talented, diverse, and energetic committee members to make each event a success for everyone involved. Become an advocate for individuals with intellectual and developmental disabilities - Visit our Advocacy section to learn more about the key issues currently faced by The Arc and its stakeholders, and how to get involved in advocacy. Participate in our Action Alerts - provide us with your email address to stay up-to-date on Action and Safety Alerts from The Arc of Somerset County. For additional information, please contact The Arc Foundation of Somerset County at 908-658-3805. For additional information about joining The Arc of Somerset County Board of Directors, please review the Board Member Responsibilities and Nominating Criteria.